and proofreaders wherever they are! From the customer’s quote request to the delivery of the end result, everything is automated so that all the steps to be done are not more than a few mouse clicks. 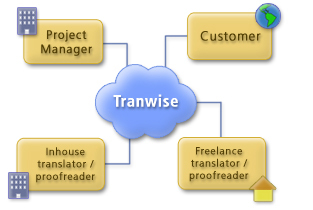 TRANWISE CONNECTS PROJECT MANAGERS, CUSTOMERS, TRANSLATORS, AND PROOFREADERS WHEREVER THEY ARE! Whether working from home or sitting in the office, everyone involved in the translation process has live contact with the people working on the same projects. Forget about the emails or pink notes that a project manager used to send to the translators asking if they are available to take a job. Forget about searching your list of translators to see which translators know a language combination. Now, with just one click, all your translators knowing that specific language combination are informed about the job and can reply to it.